In the fall of 2015, low-cost laser “star” projectors became widely available. The cost was around USD $40 for a “Star Shower” projector, heavily advertised for outdoor Christmas lighting. Since then, numerous companies have been selling these home laser projectors. They use a diffraction grating to split up a beam into multiple dots or shapes. For the most part, the individual beams appear to be safe for brief, accidental exposure to eyes as long as a person does not deliberately stare into the beams. Star projectors should be kept away from children. They may not know to avoid exposure. We heard of one person who put a projector in a young child’s room; this is not recommended. The following is from a letter we provided to a person with a garden laser projector that had beams of less than 1 milliwatt. 1) The power of any given laser beam from the device is said to be less than 1 milliwatt. This is low -- the U.S. legal limit for a laser pointer is 5 milliwatts. A 1 mW beam normally would not be a significant hazard to an aircraft. 2) Aircraft cannot safely travel between the laser source and the termination surface (house or trees). Thus, even a low-flying helicopter could not intercept the beams. There is no U.S. federal law that would prevent possession of a laser garden light, or use of it when terminated as described above. It can be difficult to terminate all of the beams on such a device. Some beams may go over the roof of a house, or may go through gaps in tree foliage. The projector should be arranged to prevent beams from going into airspace. For example, the projector could be placed high, aiming down onto the house so any stray beams do not enter airspace. Or the user could mask off stray beams (for example, if the projector is placed on the ground aimed upwards towards the house but a mask cuts off the top beams that would go over the roof). But if beams do enter airspace, then there can be a few potential problems. As background, here are the visual interference hazard distances of this laser: For a green beam of 1 mW with a 1 milliradian divergence, the light could cause flashblindness to 110 feet, could cause glare to 500 feet, and could be a mental distraction to 5,000 feet. 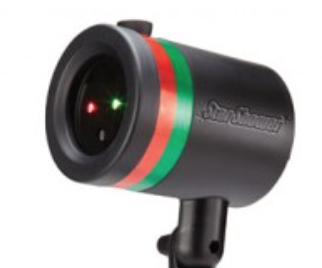 For a similar red beam, the distances would be 1/2 as great (shorter). Note that the beams could not cause eye injury to a pilot. The main problem is if one or more beams entered the cockpit of an aircraft and distracted or otherwise interfered with a pilot. Especially with a large number of beams, this "swarm" could be annoying enough that a pilot reports this to law enforcement. A fixed wing aircraft may not be able to pinpoint the source, but a helicopter certainly could. Almost all arrests for laser misuse against aircraft involve helicopter pilots reporting the exact location. There are a few cases involving laser garden lights interfering with aircraft. In all cases we are aware of, the laser user was let off with a warning. For a typical homeowner, there would not be any arrest or prosecution, especially if the user truly was trying to keep beams out of airspace. Arrests usually happen for tracking/aiming, and when the perpetrator is involved in other illegal activity as well as the lasers (being found with drugs, being on probation, etc.). Thank you for this follow up. I have taken all of your recommendations and suggestions into consideration whenever I use the laser garden light. I have now installed a removable extended cone over the projection lens, which blocks out the wide angle light points. Whether shining it on the side of our home or into our poolside trees, the smaller display has made it much easier to avoid/minimize any light points entering the sky. Using these legally in the U.S.
For completeness, here is the U.S. federal laser pointer law, and the law for more powerful lasers. Federal law states that "Whoever knowingly aims the beam of a laser pointer at an aircraft in the special aircraft jurisdiction of the United States, or at the flight path of such an aircraft, shall be fined under this title [USC Title 18, Chapter 2] or imprisoned not more than 5 years, or both." This law does not make any distinction about the power of the laser, or the beam's brightness at the aircraft, or even whether the beam hit anything. It is sufficient that a person "knowingly aims" the beam at an aircraft, or at the flight path of an aircraft. If a proponent wanted to deliberately aim lasers into airspace, then FAA would request that they fill out the Notice of Proposed Laser Operation(s) found in FAA Advisory Circular 70-1. FAA would evaluate the laser use and would issue a letter of non-objection if everything seemed acceptable. To sum up, a person should use his or her laser “star projector” Christmas/holiday/garden light responsibly by terminating as many beams as possible. If an aircraft should pass through a stray beam, and a pilot was sufficiently upset to contact law enforcement, it is almost certain that there would only be a warning. At that time the user could simply stop using the laser garden light in a configuration where beams could go into airspace. 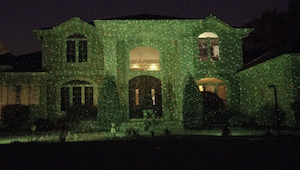 A LaserPointerSafety.com news item about Star Shower Christmas projectors is here. It includes measurements of the laser power of the projectors. Additional LaserPointerSafety.com news items about Star Shower-type projectors are listed here. A hacker opened a three-color Christmas laser projector. He found the blue and green beams inside, once focused, were “both at least 100 mW”. The blue beam was “easily able to burn pieces of paper and punch holes in black plastic.” The original article is here, a summary with commentary by LaserPointerSafety.com is here.